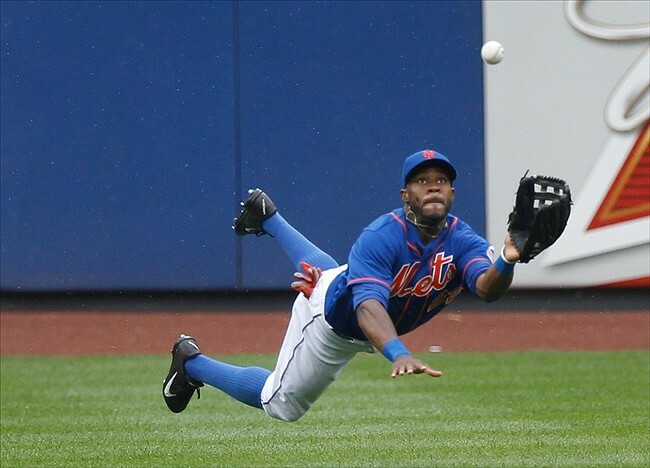 On January 5, 2016, Eric Young Jr. quietly signed a contract with the Milwaukee Brewers with an invitation to spring training in the big-league camp. I say quietly because most reporters gave the signing an obligatory two or three paragraph article after it was first mentioned December 31, and finalized a few days later. Of course there is more to this signing than meets the eye since his father once played for the Brewers. So today on the blog I’d like to provide a bit more depth and backstory than has been reported so far. To tell Junior’s story, first let’s go back and take a look at his father’s story and stint with the Brewers. Eric Young, or ‘EY’ as he was nicknamed and will be referred to going forward, had a pretty good career in the big leagues and played for 15 seasons all told. He was born in Brunswick, New Jersey, and stuck around to play both baseball and football at Rutgers. EY decided to pursue a career in baseball and was drafted in the 43rd round of the 1989 draft by the Los Angeles Dodgers. Yup, you read that right – the 43rd round. But that didn’t stop him from hitting .330 that year in the Gulf Coast League. EY generally tore it up in the minors, with a high batting average and on base percentage. His other great asset was speed, as he stole 76 bases for Vero Beach the following year. He didn’t strike out much and was also versatile in the field, playing both second base and the outfield with errors early on that he improved on with age. EY was not a power hitter, but that didn’t matter as he made his debut for the Dodgers in 1992 at age 25. He was mainly to get on base and steal, but only got a chance to do that in 49 games that season. Left exposed to the expansion draft, he was selected by Colorado as the 11th pick overall, and from here things really took off in his career. On April 9, 1993, Young hit a home run in the first ever Rockies home game. He swung the bat pretty well in his first full big league season, hitting .269 to go with 42 RBI’s and 42 stolen bases. Young was caught stealing 19 times, a mark he would equal in 1996. The stolen base totals would only improve as Young aged – he had 53 steals in 1996, and 54 with the Chicago Cubs in 2000. He had perhaps his best season in 1996 when he won the Silver Slugger award at second base, turning in a .324 batting average. EY was also named an All Star in 1996. 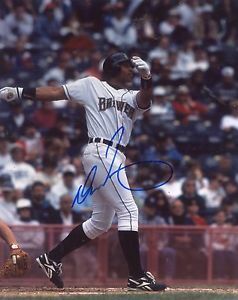 Despite Young being the career leader in steals with the Rockies, he was traded late in the 1997 season to the Dodgers for Pedro Astacio. He spent the remainder of the season and the following two in a Dodgers uniform. He played in 117 games at age 31, hitting .285 in 452 at bats. His numbers the next year (1999) are eerily similar in terms of games, at bats, and hits. He did make a jump to 51 steals however – up from 42 the previous year. EY was traded again after the 1999 season, this time to the Cubs in a multi-player deal. It was with the Cubs that he really had a chance to shine, bouncing back to near career highs in several levels. He played in a lot more games with the Cubs – 153 games in 2000 and 149 games in 2001. Young’s stolen base totals declined sharply however, from 54 the first season to just 31 the next. At age 34, it was looking like his speed on the basepaths was a thing of the past. 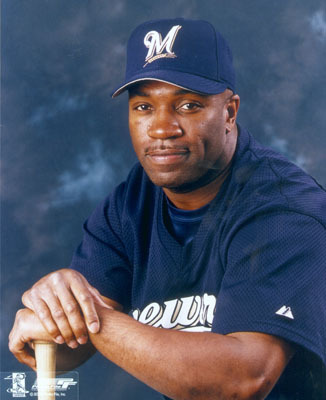 Young was granted free agency after the season ended and the Brewers signed him to a two year contract on January 17, 2002. He was given the starting job at second base for a team ranked first in strikeouts the previous year, coming off a 68-94 record. Young’s presence on the team didn’t help as the Brewers regressed to a 56-106 record. He had a solid season with a .280 batting average and 31 stolen bases. The team improved the following year, but on August 19, Young was traded to the San Francisco Giants for minor league pitcher Greg Bruso. The Giants needed insurance for starting second baseman Ray Durham, who had been on the disabled list since August 8. Young had been displaying some increased power that season, as he hit 15 homers, all with Milwaukee. His previous best had been just 8 homers in a season. Part of the reason to trade Young from Milwaukee’s standpoint was to save money. The Giants would pay the remainder of Young’s $2 million contract for the 2003 season, then had a team option at $3 million to keep him for the following season. Bruso never made it to the majors and retired after the 2005 season at age 25. Ironically, Durham was traded to the Brewers from the Giants on July 20, 2008. When the Brewers made the playoffs that year, he was on the roster that lost to the Philadelphia Phillies in the first round, 3 games to 1. Young went on to a career in coaching, and since 2014 has been the baserunning/outfield and First Base coach for the Rockies. He is remembered in Milwaukee for being the Opening Day starter at second base in 2002-03, just one of 10 second basemen in Brewers history to make multiple season-opening starts. He also was unfortunately saddled with playing on one of the worst teams in franchise history the first season, and then a team in transition the second year – one that had several changes in the offseason. Junior made his debut just over a year to the date after his father retired, and also in a Rockies uniform. Like his father, he grew up in Jersey, but left home to attend Chandler-Gilbert Community College in Arizona. Junior was drafted higher than his father – by the Rockies in round 30 of the 2003 amateur draft. He signed in June, 2004, and was sent to the Rookie league for the next two seasons. His climb to the majors took five seasons before he made his debut late in 2009. The small sample size of stats included a .246 batting average to go with four steals in eight attempts. The following three seasons were split between the majors and minors. While Junior’s batting average remained in the .240’s until he hit .316 in 174 at bats during 2012, his on base percentage always was 80 to 100 points higher. The ratio of times caught stealing had dropped and he was showing the same versatility as his father, playing both second base and the outfield. All things were pointing toward a breakout season in 2013. Junior started the season again in Colorado, but was designated for assignment on June 12, and then traded to the New York Mets five days later. The change of scenery did Junior well, as he went on to have that breakout year, finishing with career (to date) highs in many categories. He played in 148 games, had 134 hits in 539 at bats, and drew 46 walks. His .249 batting average was nothing special and he did strike out 100 times, but the biggest stat was his jump to 46 steals. He wound up the National League stolen base leader by stealing his 45th and 46th bases in the final game of the season against…wait for it…the Milwaukee Brewers. Another highlight that season was a bad one – a gruesome injury to Atlanta Braves starter Tim Hudson when Junior inadvertently stepped onto the back of the pitcher’s right leg when trying to beat out a grounder. The diagnosis for Hudson was a broken ankle with a surgery in order to recover. Just when it was looking like Junior would string together some similar years, he was derailed in 2014. He had some injury trouble, including a stint on the Disabled List for a hamstring pull. There was also a freak injury when he was hit below the eye with a ball that bounced off the screen in batting practice. With his at bats cut in half of the course of the season, his batting average tumbled to .229 and this led to being non-tendered by the Mets in the winter. He then signed a contract with the Braves with an invite to spring training in 2015. His time with the team didn’t last long, as he was designated for assignment on June 5. The Braves traded him back to the Mets for cash in August, and he finished the season there before becoming a free agent this past November. Junior struggled mightily at the plate with just a .153 batting average and .217 on base percentage. So that brings us back to Junior signing with the Brewers. If he makes the team, he would reportedly earn $1 million plus incentives. EY and Junior would also become just the third father/son combo to play for the Brewers in the team’s history. Just that fact alone is pretty special. There have been over 100 father and son combinations in the big leagues to date. Going back to the first Brewers team in 1970, there were six combos of players that either had a father play before them or a son play later in the big leagues. But the biggest oddity with these father/son combos is there were two fathers who had sons that would also later play for the Brewers – an even rarer feat they would play for the same team. 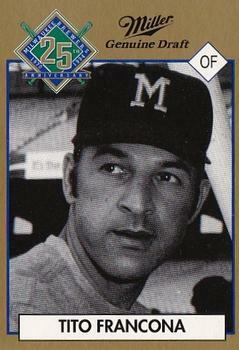 Tito Francona played first base for the Brewers in 1970 after being traded from the Oakland A’s. The team shuffled a lot of players that year and they picked him up to add a veteran to a youthful roster. 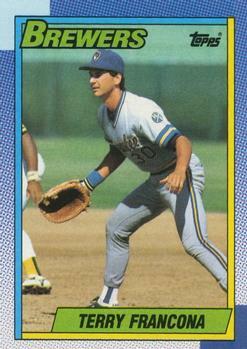 Tito’s son Terry would play for the Brewers in 1989-1990 at first base and on the outfield. He even made one appearance as a pitcher. After his playing career ended, Terry of course managed the Boston Red Sox to World Series championships and now manages the Cleveland Indians. Both Tito and Terry ended their playing careers with the Brewers. 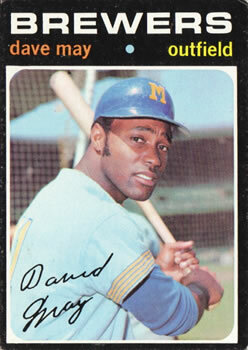 Dave May was an outfielder in 1970, and his son Derrick went on to also play in the Brewers outfield in the 1995. Dave returned to the Brewers in 1978 before finishing his career with the Pittsburgh Pirates. The elder May had his best years with the Brewers, especially 1973 when he hit .303 with 25 homers and 93 RBI’s, plus made the All Star team. He was part of the trade in November, 1974, that brought Hank Aaron back to Milwaukee. May had been moved from center to right field at the beginning of the season, plus had battled a severe flu bug in spring training. His batting average tumbled to .226 and the Brewers felt the trade would benefit both teams. For defense, a very simple look is that Dave had 50 errors in 2295 chances for a .978 fielding percentage. Derrick had 26 errors in 1097 chances for a .975 fielding percentage. Defensively, Tito had 26 errors in 1641 chances for a .984 fielding percentage. Terry had 19 errors in 1943 chances for a .992 fielding percentage. On defense, EY had 151 errors in 6373 chances, good for a .976 fielding percentage. Junior had 9 errors in 545 chances for a .985 fielding percentage. Personally, I’m rooting for Eric Young Jr. to make the team and join the Mays and Franconas as Brewers father/son combos. In the outfield he will be battling Keon Broxton, Alex Presley, Rymer Liriano and Shane Peterson, among others, for a spot on the team. As Junior competes for a roster spot, he has also taken on his father as a roommate in Mesa, Arizona. In a season where many are saying there isn’t much of a reason to watch the team, Junior’s story could bear attention. Again, his infield/outfield versatility may help his cause – but he needs to get on base and make things happen. Here’s hoping his versatility and speed can be an asset to the team. Feel free to share this post with your favorite social media outlets using the buttons below the photos. Also, please visit the Baseball Bloggers Alliance where I am a contributor. Thank you!